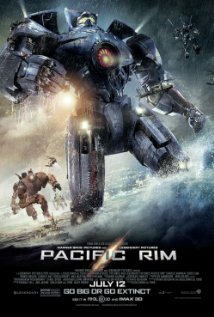 Pacific Rim (2013), PG-13, 131 minutes - Giant monsters. Giant Mechs. Guillermo del Toro's imagination and direction. For these reasons, Pacific Rim was at the very top of my Most Anticipated Films of 2013 list and I'll tell you right now, it was spectacular. As far as I'm concerned, it didn't disappoint on any level, which, considering how long I've been looking forward to this film and how excited I was for it, is pretty impressive. The film takes place in Earth's not-to-distant future (the prologue actually places the initial events in the present). A rift has opened on the floor of the Pacific Ocean, creating a portal to another universe inhabited by giant monsters called Kaiju (Japanese meaning 'giant beast'). Kaiju begin to periodically make their way through the rift and in order to combat their devastation, the world's nations unite to construct giant humanoid mechs that come to be known as Jaegers (German for hunter). The Jaegers are controlled by human pilots via a neural link (which proved to be too much for a single human mind to handle, leading to the two pilot system that is prominently featured in the film). The opening narration provides this history and explains that the development of the Jaeger program provided us with the means not only to fight back, but to become overconfident in our abilities to defeat the Kaiju. The Kaiju evolve, getting bigger and better at attacking our defenses. By the year 2020 the Jaeger program is having trouble sufficiently handling the Kaiju threat and by 2025 the program is decommissioned. The countries of the world decided to build massive walls around their ocean-side borders as an alternate means of defense. This quickly proves useless when a Kaiju breaks through the Sydney, Australia wall before being taken down by one of the recently decommissioned Jaegers. It is at this is the point in the 'Kaiju War' that Pacific Rim's primary story line picks up. The cast is made up of a ton of familiar faces, many of which are better known for their television roles than their previous film credits. Most prominently featured is Charlie Hunnam of Sons of Anarchy fame, who plays Raleigh Becket, a Jaeger pilot who lost his co-pilot brother during a Kaiju attack. Others include Diego Klattenhoff (Yancy Becket), Charlie Day (Dr. Newton Geisler), Burn Gorman (Dr. Gottlieb), Robert Kazinsky (Chuck Hansen), Max Martini (Herc Hansen), and Larry Joe Campbell (Construction Worker). Adding bigger name clout to the cast are Idris Elba (Stacker Pentecost), and Ron Perlman (Hannibal Chau). Also not to be forgotten are Rinko Kikuchi (Mako Mori), and Clifton Collins, Jr. (Ops Tendo Choi). Hunnam proves capable of being cast as the lead in a film, and Elba provides the leadership, care, and intensity that a character like Pentecost necessitates. Day, Gorman, and Perlman add entertaining levity to Pacific Rim, keeping it from getting too serious, but also provide important plot information. The design and visual effects in Pacific Rim are top notch. I don't usually bother with 3D versions of films, but that's what was showing at the time I was able to go. The 3D is very well done and actually enhances the film instead of just being a gimmick. del Toro avoids the seemingly obligatory 'fire something directly at the viewer' type of scenes that many 3D films abuse. He makes the use of 3D functional, adding a great sense of depth to many scenes, especially those inside the Jaeger cockpits. The design of both the Jaegers (influenced by the countries in which they were built) and the Kaiju were excellent. Each was unique and it helped to keep the massive battle scenes interesting. Guillermo del Toro has been one of may favorite directors for quite a while. I haven't seen a film of his yet that I didn't thoroughly enjoy and I'm glad that Pacific Rim turned out as good as it did and it lived up to my high hopes. If you like any of his previous work, Pacific Rim is a must see. It may be the biggest budget/scale movie that he's done to date, but his creativity and attention to detail are all over this film. Even if you are not a del Toro fan, or aren't even into monsters or mechs, Pacific Rim is an event type movie that needs to be seen on the scale that only a theater allows. It is well worth the price of admission, either in standard 2D or 3D, whichever your budget allows. - There is a short scene mid-way through the credits. It isn't anything important to the story or a teaser of things to come, but it does involve one of the more colorful characters in the film. - It's always nice when a film that you look forward to for so long lives up to all of your expectations. I've seen this twice already and there's not much of anything that I can think of to nitpick about (as opposed to other big films released this summer). Because of that I admittedly went in with a little apprehension. I never should have doubted Guillermo del Toro! - Other things that came to mind while watching Pacific Rim: Hellboy/Hellboy II: The Golden Army, Avatar, Neon Genesis Evangelion, Star Wars: Episode V - The Empire Strikes Back, Transformers, and Godzilla (or about any other monster flick). - I've never seen any of Sons of Anarchy, but after seeing Charlie Hunnam in Pacific Rim I think I'll have to check it out. It doesn't hurt that it also stars Ron Perlman, a personal favorite.